I don’t think of France as a particularly tumultuous country in terms of wine. Its AOC system is well-defined and strict, meaning that when you buy a Chablis or a Beaujolais, you can be relatively certain about how that wine will taste. But in the south, in the Languedoc region in particular, things get a lot more wild and wooly. In the manner of Italy’s Super Tuscan vintners, many important Languedoc producers “ignore the AOC system completely and put most of their effort into making high-quality vins de pays,” according to The Oxford Companion to Wine. Vins de pays, or country wines, were originally intended to be simple, tasty wines which have some basic hallmarks of the region from which they came. But according to The Sotheby’s Wine Encyclopedia, “This category of wine includes some of the most innovative and exciting wines being produced in the world today.” The lack of restrictions in this class of wines “encouraged the more creative winemakers to produce wines that best expressed their terroir without being hampered by an overregulated AOC system…” the Encyclopedia goes on to say. The most successful of the vins de pays, according to the Encyclopedia, is the Vin de Pays d’Oc, which encompasses the entire southwest coast of France from Spain almost to Avignon. The refreshingly easy-to-pronounce name means, rather strangely, “wine of the yes country.” In the ancient local Occitan language, “oc” is used for “yes” instead of “oui,” so if you’re in oc country, you know you’re in the south (though you’ll be hard pressed to find an Occitan speaker nowadays, thanks to France’s policy of stamping out any language or dialect that wasn’t high French, which continues even now to a certain extent). I’m very fond of this unruly region of France, and thus it was with pleasure that I received a complimentary sample of a Vin de Pays d’Oc, especially because it was made from a grape variety I’d never heard of: Marselan. Created in 1961 and authorized for Vin de Pays d’Oc use just 23 years ago, this crossing of Cabernet Sauvignon and Grenache Noir was created specifically for the Languedoc terroir, and it “can offer respectable levels of both color and flavor,” according to the Oxford Companion. We were looking for a wine to import from France and a friend of ours, a broker in France who works for Scodex, Nicholas Reble introduced us to this grape. I was intrigued with the facts about Marselan… This Marselan is grown and produced by Cantalric co-op servicing the region of Pays Cathare. This region is bordering the Mediterranean Sea up to the Alaric mountain… I love the combination of Grenache and Cabernet Sauvignon. The flavors are very intriguing. Intriguing indeed. It has an aroma that’s both darkly fruity and earthy — one friend I tasted the wine with detected a note of barnyard in the nose, and another remarked, “It reminds me of Asian preserved plum, oh, but don’t write that down — no one will know what it means.” Maybe not, but it certainly sounds enticing to me. On the palate, the wine has ample fruit tempered by earthy undertones. It tasted meaty, hearty and spicy, with an aromatic finish of cherry pie. Some in the group thought the wine’s earthy character dominated, but I found the earth and fruit to be very well-balanced. 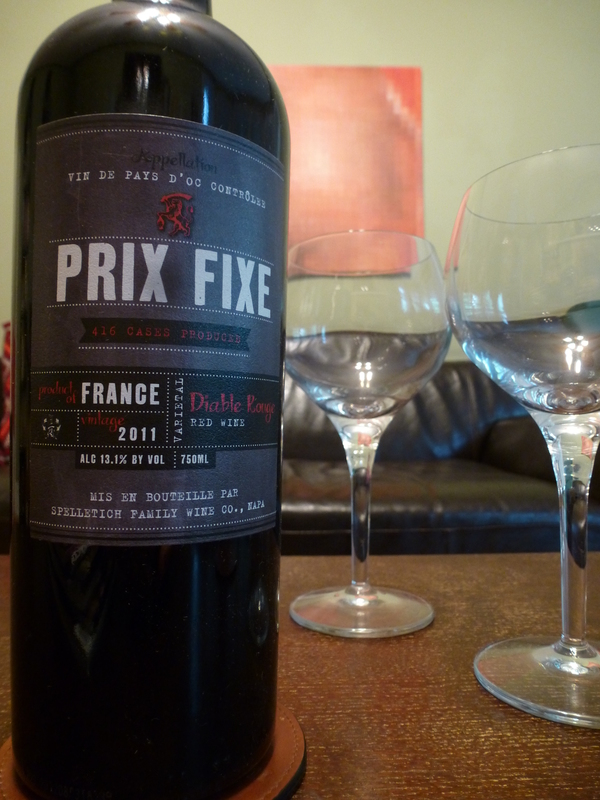 It packs a lot of flavor, this red devil, making it a fine example of what wild and wooly Languedoc can produce, and very fine value at $18 per bottle. 2011 Prix Fixe “Diable Rouge” Marselan: Darkly fruity, earthy and fun, ideal for a summer barbeque. Be sure to chill in the refrigerator for 15 to 30 minutes to bring it down to cellar temperature. Price: $18, and a fine value at that. Find It: You might not see this wine in your local shop, since only 416 cases were produced, but you can purchase it on the Spelletich website. I couldn’t agree more. Visiting the two natural wine fairs in London this spring and currently travelling to the southwest of France I expect a bursting trunk of unusual & innovative deliciousness coming back home in a couple of weeks. Focussing on Vin de Pays and so the un-conventional stuff I’ll keep my eyes open the Diable Rouge you described! Cool! If you make any exciting discoveries, be sure to let us know. Have fun in southwest France!